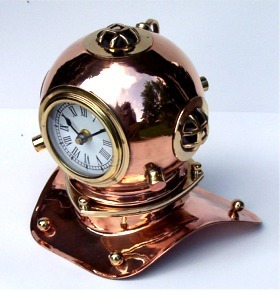 The classic diver's helmet desk or mantle clock styled after the world famous US Divers MK-V Deep Sea Diver's helmet. Made of high quality pure copper with solid brass trim. The clock is a precision battery operated quartz movement with traditional Roman Numerals. 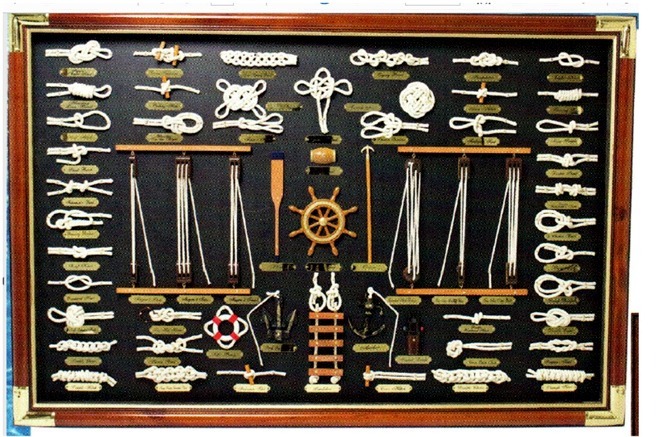 A handsome piece for every nautical decor at home or office. The helmet sits flush on a flat surface without the need of a base or stand. Great piece for a Maritime office and desk. There can only be ONE on the boat. Captain's ceramic coffee mug in non-tipping design. Has a spill-proof cap and non-skid bottom pad. Size: 4-3/4" x 4-3/4"16 oz. Solid Brass Look-Out Lamp mounted on a solid Red Oak base with 3 position table lamp socket. Hand made by our craftsmen in the U.S.A. Three (3) position switch allows for Anchor Lamp or top lamp to be turned separately or together. 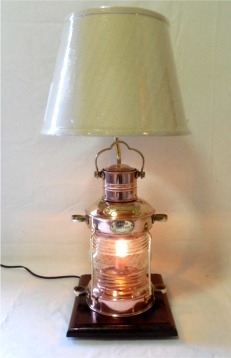 A solid copper classic period sailors Look-Out lamp used on sailing ships for hundreds of years. 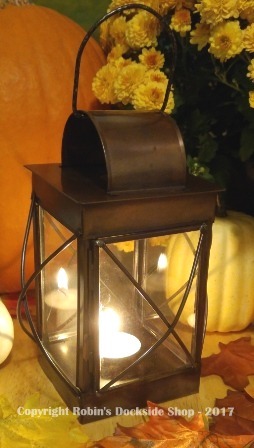 A Versatile oil burning lantern could be used for many purposes. Easily wall mounted and best used with an electric light kit installed. Size: 12" Tall with handle down. Modeled after many lighthouses used all over the world to warn ships of dangerous waters. Constructed of heavy tin and real pebbles at the base. Can have electric light installed. NEW ITEMS: Just the thing for your holiday table at home or on the water. 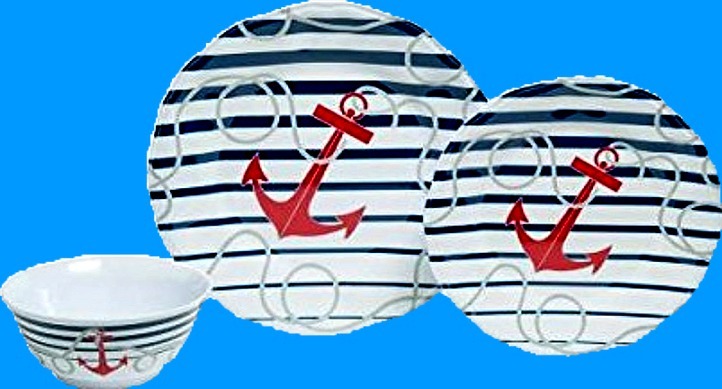 Nautical theme dinnerware sets in tempered glass and unbreakable Melamine. Dockside was created by a U.S. artist to give that purely nautical feel for your table at home or on your boat. Graduated nautical blue stripes and a red anchor with subtly woven gray rope on a bright white melamine. This heavy weight melamine has the look and feel of ceramic dinnerware. The 11" Dinner Plate, 9" Salad Plate, and 20 oz Soup/Cereal Bowls all have a non-skid ring on the bottom to prevent sliding on your table. Service for four includes: 4 ea. Dinner, Salad, and Soup/Cereal bowls. 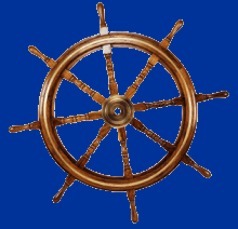 For a nautical look at home or on your boat or yacht. Tempered glass is break resistant, dishwasher safe, microwave safe and will NOT scratch with a knife. Each piece is heated to 700 degrees F during manufacturing to make them very durable. If broken they don't shatter into hundreds of glass shards. Service for four set includes: 4 ea. Dinner Plates, 4 ea. Salad Plates and 4 ea. Soup/Cereal Bowls. Iron square candle lantern used by most crew members on every ship afloat. Four glass sides and metal cage. Great Fall display lantern. Shipped with one Tea-Light candle. 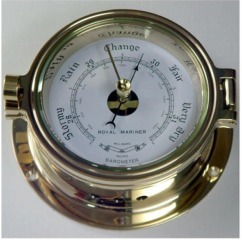 Precision barometer in a highly polished cast brass case with beveled glass front. Not a decorative toy. A barometer measures changes in barometric air pressure. Dual calibration: US -millibars / Metric/ mmhg. A very different style table lamp. Printed burlap bag that says "Welcome Sailors" over a wood base with nautical trimmings and cotton stitched shade. 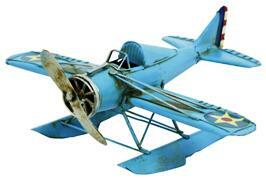 Another Robin's Dockside Shop exclusive. Made in our own shop. 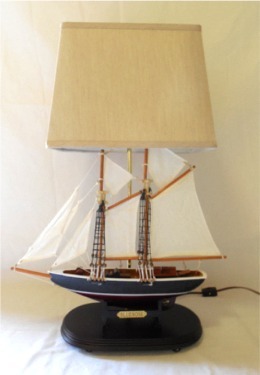 Finely detailed hand made sailboat models made into great small table lamps. Sailboats are made of hard and soft woods with cloth sails on a white pine wood base with brass electrical parts and inline switch. Buy the set or individually. An excellent mirror at home or office or aboard your cruiser or yacht, This knot board mirror is great in any setting or nautical decor. Twenty hand tied sailor's knots under glass surrounding a clear plate glass mirror. 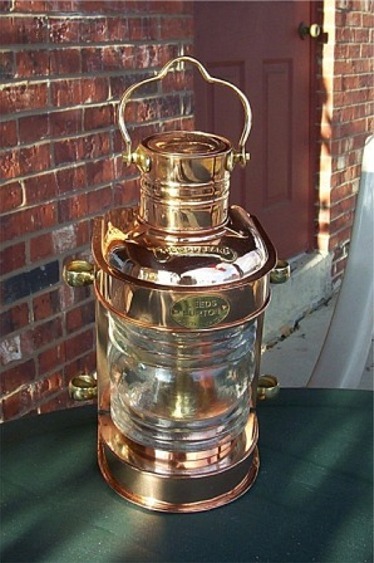 Classic antique copper navigation oil lamps that are replicas of lamps required on all vessels that are underway (moving) at night. 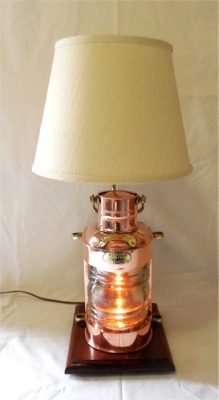 Lamps are coated in an antique copper finish over iron. Price: $49.95 - Set of Two. Solid Brass Norwegian Anchor Lamp Finally !!! Back in stock. Solid Brass Norwegian style Anchor Lamp. High quality brass lamp with heavy Fresnel lens. Styled after lamps used by Norwegian sailors and fishing vessels. 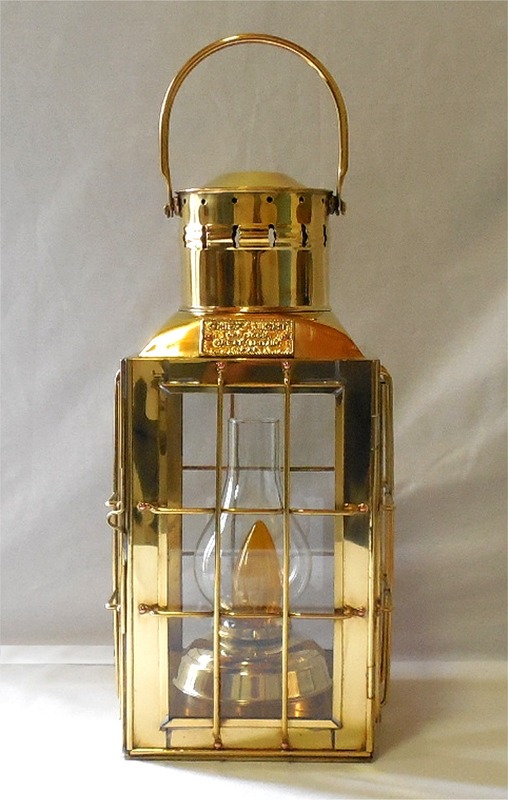 Solid Brass Chief oil lantern. High quality brass construction with glass panes and wire cage. Opens from the front for easy access. The A very high quality lantern. During the sailing ship era we learned that the wood ship's steering wheels needed a brass ring insert to make them stronger. These are excellent reproductions of those wheels. High quality teak family wood with solid brass ring and hub. Size: 36"
Solid Copper Ship's Anchor Lantern on a solid Mahogany base. Three (3) position switch allows for Anchor Lamp or top lamp to be turned separately or together. Measures 26" tall. Made in our own shop. Our very own creation. Solid Copper Look-Out Lamp mounted on a solid mahogany base with 3 position table lamp socket. Hand made by our craftsmen in the U.S.A. Luxury hotel quality Hygro Cotton set. 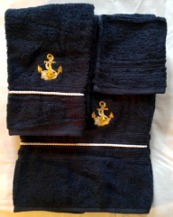 Large thick Navy Blue towel set with gold and white fouled anchor appliqués' with white dock line trim. Set has bath towel, hand towel and wash cloth. 100% Cotton. Also available in white. Bluenose model schooner table lamp. Hand made model with cloth sails and cotton rigging on a solid rosewood base with rectangular fabric shade. 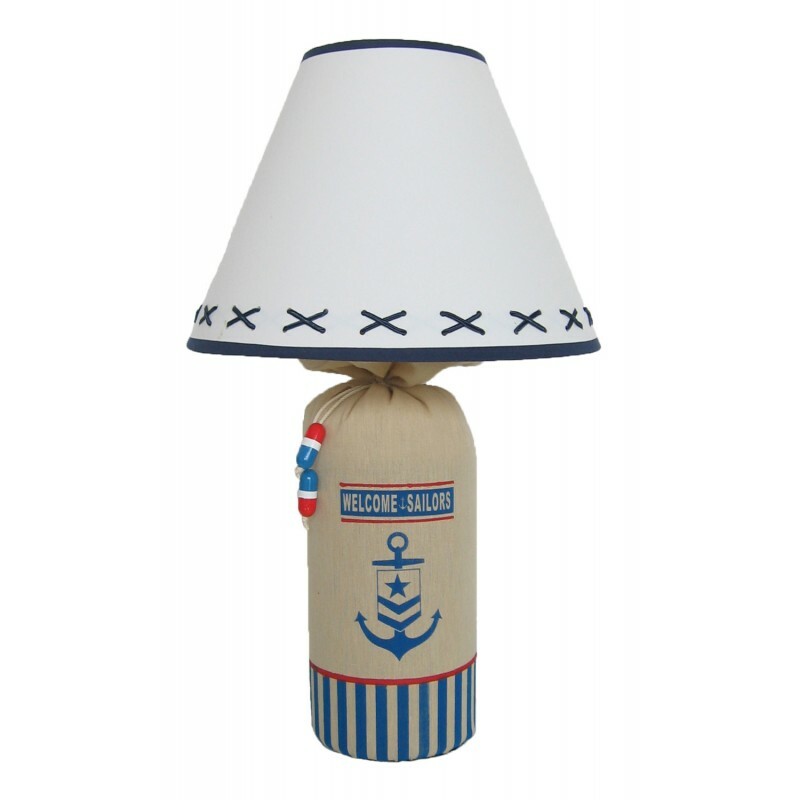 Great table lamp at home or aboard boat or ship. 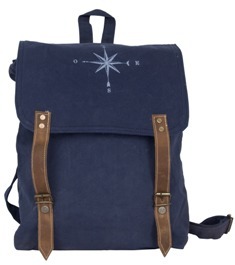 Very heavy canvas Messenger Style Backpack in navy blue with leather and canvas straps and brass snaps. Compass rose died onto the cover flap. Great carry-all for the daily commute. Special bell presentation plaques are now available in your choice of hardwood and brass plates. 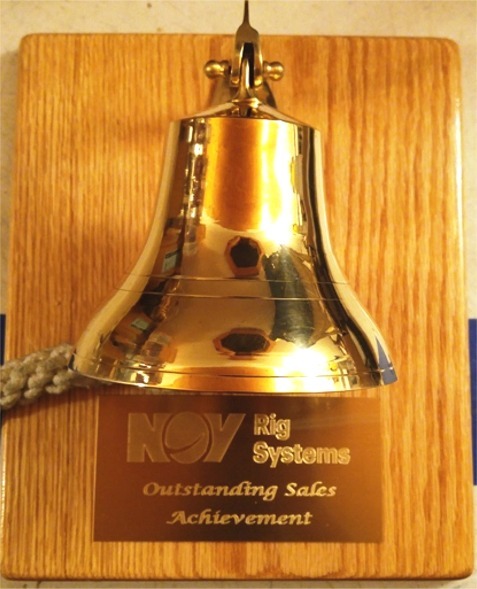 Our Solid Brass 6" Bell mounted on a hardwood plaque with engraved brass plate. 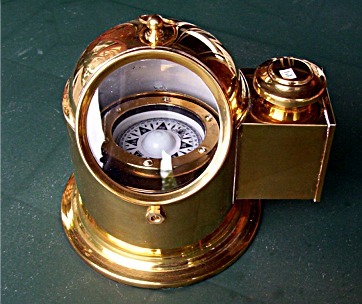 Solid Brass old style binnacle compass and side oil lamp. Reproduction model of the classic brass binnacle compass used on sailing ships and kept in lifeboats for centuries. 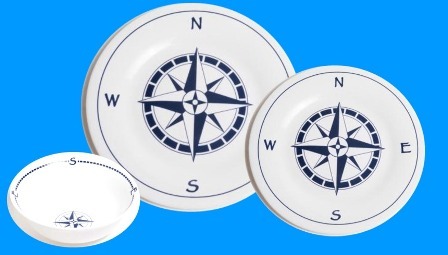 No nautical theme decor should be without a Binnacle Compass. 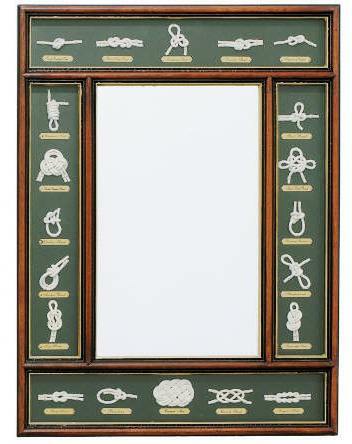 Hardwood frame with brass trim surrounds large size sailor's traditional nautical knot board shadowbox has 40 knots and 10 other nautical things. 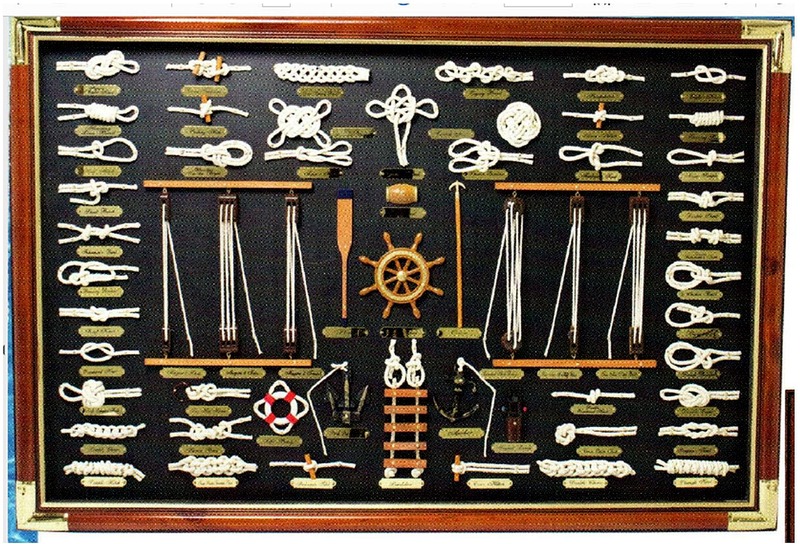 Great wall piece for any serious nautical decor. "One does NOT need to own a boat to live the nautical lifestyle"